Mary Karr is an award-winning poet and best-selling memoirist. She is the author of the critically-acclaimed and New York Times best-selling memoirs The Liars' Club, Cherry, and Lit, as well as the Art of Memoir, and five poetry collections, most recently Tropic of Squalor. Karr is also a songwriter, having collaborated with Rodney Crowell, Norah Jones, Lucinda Williams and others on a country album called KIN. ​A sought after speaker, she has given distinguished talks at prestigious universities, libraries, and writers' festivals across the world. Karr welcomes conversation with her audience and she is known for her spirited, lively, and engaging Q&A sessions. Her many awards include The Whiting Writer's Award, an NEA, a Radcliffe Bunting Fellowship, and a Guggenheim. She is also a regular contributor to The New Yorker, The Atlantic, and Poetry magazine. 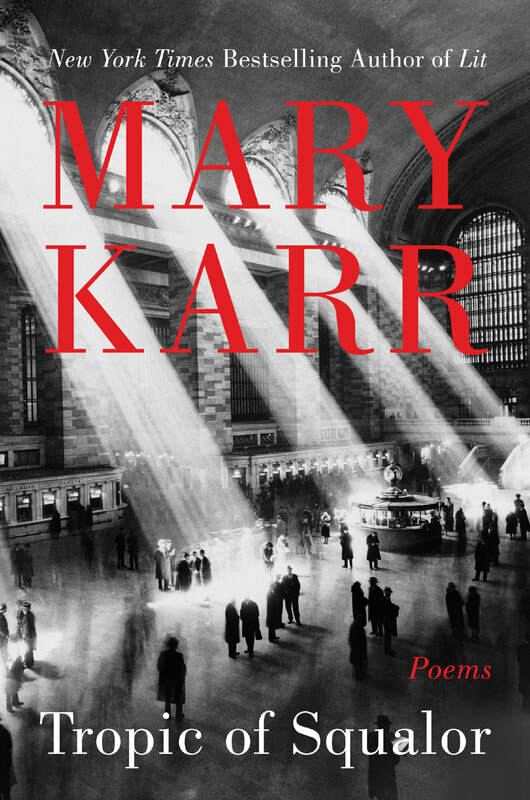 Mary Karr is the Peck Professor of Literature at Syracuse University and she lives in New York City. Long before she earned accolades for her genre-defining memoirs, Mary Karr was winning poetry prizes. Now the beloved author returns with a collection of bracing poems as visceral and deeply felt and hilarious as her memoirs. In Tropic of Squalor, Karr dares to address the numinous—that mystery some of us hope towards in secret, or maybe dare to pray to. The "squalor" of meaninglessness that every thoughtful person wrestles with sits at the core of human suffering, and Karr renders it with power—illness, death, love’s agonized disappointments. Her brazen verse calls us out of our psychic swamplands and into that hard-won awareness of the divine hiding in the small moments that make us human. In a single poem she can generate tears, horror, empathy, laughter, and peace. She never preaches. But whether you’re an adamant atheist, a pilgrim, or skeptically curious, these poems will urge you to find an inner light in the most baffling hours of darkness.